2. Season the pork tenderloins generously with salt flakes and freshly ground pepper. 3. Lay out 2 sheets of plastic food wrap about 15cm longer than each tenderloin. Lay the prosciutto down the middle vertically, slightly overlapping, to fit the length of the tenderloin. 4. Lay sage or oregano leaves down the centre of the prosciutto, slightly overlapping. Place the pork on top of the sage / oregano. 5. 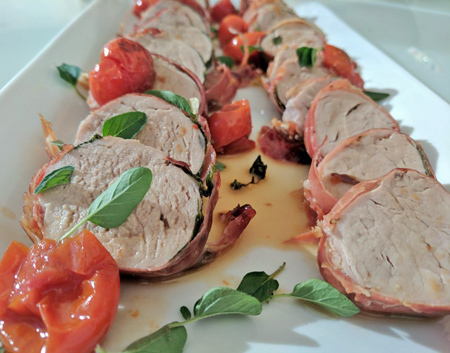 Using the plastic wrap roll the prosciutto tightly around the pork tenderloin (similar to rolling sushi). Turn the ends of the plastic wrap to secure. If not ready to cook straight away, store in the refrigerator. 6. Heat the olive oil in a flameproof baking pan over a medium-high heat. Remove the pork fillets from the plastic, add to the pan and sear on all sides, starting with the seam side down. Be careful not to break or tear the prosciutto. 7. Add the cherry tomatoes, the garlic and the wine and transfer to the oven. Cook for 15-20 minutes, depending on the size of the tenderloins – a meat thermometer should read 60°C for medium. 8. Remove the pork from the oven, cover loosely with foil and let rest for 10 – 15 minutes. 9. Slice and serve with the pan juices drizzled over. You could win a gourmet pack of Murray River Salt goodies! Sourced from the Murray Darling region, Murray River Gourmet Salt is the salt of choice at our cooking school due to its superior quality and delicate flavour. 2. Promotion commences 5 February 2019 and final entries close on 20 February 2019. 3. To enter participants must tell us in the comments below their favourite use for gourmet salt and like this Facebook Page. 4. 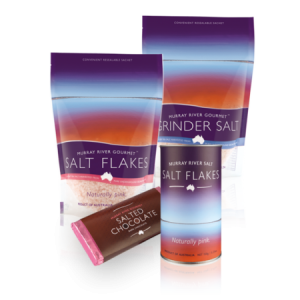 The Prize is a gift bag of Murray River Salt products. Prizes are not transferable or exchangeable and cannot be taken as cash. 5. Winners will be notified via our Facebook page on 21 February 2019.